Facial hair is still a taboo subject. Many of us are too embarrassed to admit we need to pluck, wax, laser or bleach to achieve a hairless upper lip and yet excessive facial hair (or hirsuitism) is extremely common, affecting up to 40% of all women. While rock star Patti Smith and artist Frida Kahlo were happy to sport a female moustache, most of us would like to be fuzz free; particularly on our face as excess facial hair can make us debilitatingly self-conscious. Carter Beauty leads the way in hair removal with a range of advanced hair removal techniques to deal with unsightly facial hair, either temporarily or on a more permanent basis giving you back the confidence that unwanted hair can take away. Excessive facial hair is caused by increased hormonal changes in puberty, pregnancy and the menopause or having hair follicles that are hypersensitive to the male hormones causing unwanted hairs to sprout in the most unlikely of places on our face and other body parts. There are also medical conditions including metabolic or endocrine disorders that can cause excessive body hair. Even fair-haired women can have thick and dark facial hair. Used as a facial hair removal technique for thousands of years threading is perfect for removing light and fluffy unwanted facial hair. Using a 100% cotton thread which is twisted and rolled along the surface of the skin, the thread catches the hair which is then lifted out from the root of the follicle. If your hair is light but strong then waxing is the best option for facial hair removal. Carter Beauty use Waxpert Hot Wax for intimate areas to bring you waxing without the ‘ouch’. This high quality wax gently and effectively removes hair as short as 1mm. Once melted the wax gives off a deliciously sensual scent from aromatherapy essential oils. To ensure the experience is 100% pain-free low temperatures are used and the wax is expertly formulated with skin nurturing and conditioning ingredients to reduce inflammation and soothe skin. If you’re in the market for something more permanent Electrolysis and IPL is the treatment to get you fuzz free. Electrolysis gives hair an ‘electric shock’ through a fine, sterile needle that is inserted into each follicle. This cuts the supply of blood and oxygen to the hair, killing it. After just a few treatments the hair follicle will die meaning you are hair free forever in just a few short treatments. The latest and most innovative hair removal treatment is IPL. 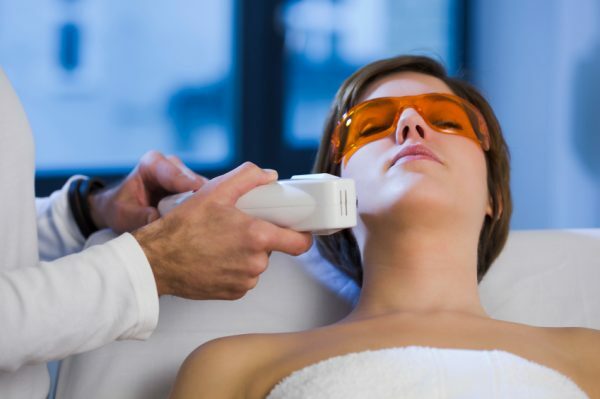 One of the most permanent methods of hair removal, IPL (Intense pulsed light) is the latest generation of light-based beauty therapies, which uses flashes of light to react with the colour pigment (melanin) in the hair, to disable follicles and stop new growth.